Do you have special movies that you watch to celebrate certain times of the year? For me, the winter holiday season (including Christmas & New Years) is never complete without watching It's a Wonderful Life. Oh, and of course I can't forget The Sound of Music and The Ten Commandments at Easter. But I can't remember watching many children's shows, with the possible exception of Charlie Brown who always had some ubiquitous holiday special going on throughout the year. So I think it is exciting that PBS has announced that the first-ever Cat in the Hat Christmas special, THE CAT IN THE HAT KNOWS A LOT ABOUT CHRISTMAS! is scheduled to air on November 21st. The adventure finds the Cat in the Hat, Nick and Sally on a journey around the world to help a lost reindeer find his way home to Freezeyourknees Snowland in time for Christmas. On the way, the Thinga-ma-jigger breaks down, and they depend on a variety of animals – from African bush elephants to bottlenose dolphins to red crabs – and their remarkable abilities to help them make an amazing journey home. This one-hour special premieres on Wednesday, November 21 on PBS KIDS, with encore presentations throughout Thanksgiving weekend and in December (check local listings). But in addition to the show, PBS has launched a new online game Freezeyourknees, Follow Me, Please! featuring Ralph the Reindeer who is a long way from Freezeyourknees Valley. The Cat in the Hat is giving the lost reindeer a ride home when the Thinga-ma-jigger suddenly loses its power and makes an emergency landing. Only you can guide Ralph back to his family in time for Christmas – with help from some amazing animal friends! Grounded in an animal science curriculum, Freezeyourknees, Follow Me, Please! offers players three levels of game play, each level with its own animal-themed “Follow Me” challenge. 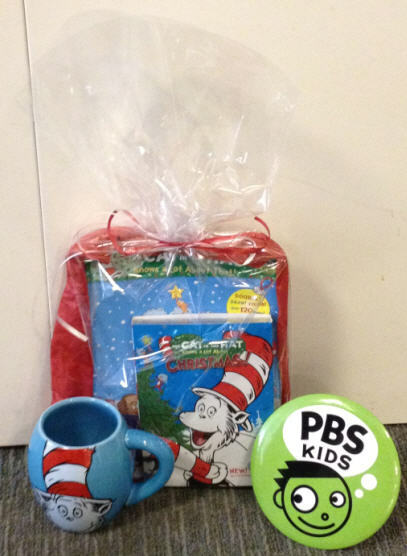 PBS has graciously offered a THE CAT IN THE HAT KNOWS A LOT ABOUT CHRISTMAS! Prize Pack that includes a DVD of the new episode, a copy of "Walkin' in a Sticker Wonderland!" (a new sticker book based on the show), and a Cat in the Hat mug. Wouldn't this be a great Christmas gift? To enter this giveaway, all you have to do is leave a comment below. 1) Follow PBSKIDS (@pbskids) on Twitter. Disclosure: I am a PBS Ambassador and received a sample prize pack and DVD to review.